MixUp DressUp is a perfect app to encourage creativity in the 3-and-up crowd. 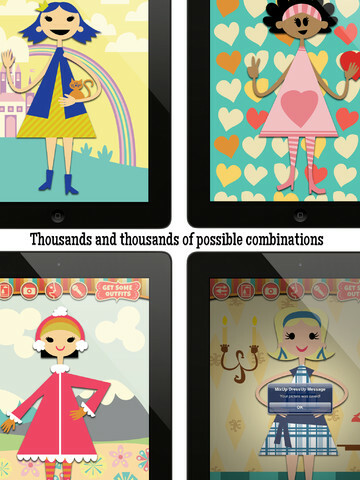 The MixUp DressUp interactive dress-up app gives players ages 3 and up the opportunity to create dress-up combinations with just a swipe of their finger. Design super-cute fashions with the app’s mix-and-match format. Also, players can record their voice so that they can add their own cool comments! MixUp DressUp is a fun and child-friendly app. There are NO ads and NO links to Facebook or email. MixUp DressUp was developed by a father and his two young daughters. Dad developed the app and daughters helped design the graphics and provided their voices. Have your little one add their voice and join in the fun, as well! The fashion models are split into three horizontal panels. Little fingers simply swipe across the top panel to select one of nine faces. Next, they swipe the middle panel to select the outfit they like best. Then, they swipe the bottom panel to select matching shoes. Use of the ‘swiping’ motion rather than ‘dragging-and-dropping’ allows even the most uncoordinated of hands the opportunity to create an elegant and fun creation. After flipping the panels to their heart’s content, kids can choose from 7 artfully designed backgrounds with just a tap on a button. Once their creation is complete, they can save it to a photo album. The MixUp DressUp app allows the player to record their own voice and also includes an option of two different voices that provide encouraging comments and a fun ‘poke’ phrase throughout the mix-and-match process. Download NOW or visit www.mixupdressup.com to see the MixUp DressUp app in action.